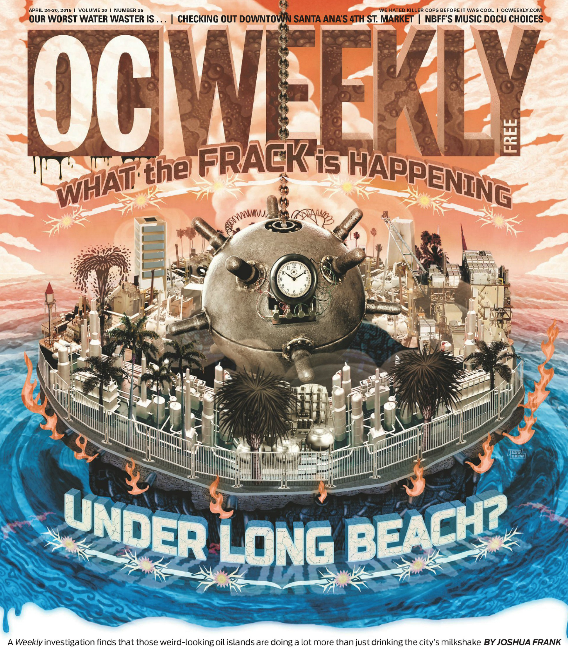 What The Frack is Happening Under Long Beach? Perhaps you’ve driven past them at night: several towering panels lit up like a psychedelic art installation, with a 45-foot waterfall gushing down the side and onto the boulder-strewn, pedestal-shaped, very-much-manmade island. The brightly painted structures seem harmless enough–if a bit out of place several hundred feet offshore from Long Beach’s affluent Bluff Park neighborhood–but what goes on behind the palm-lined façade is profoundly controversial and potentially very dangerous. Built in 1965, the four THUMS islands–so named for the companies that first developed the sites: Texaco, Humble, Unocal, Mobil and Shell–were designed by esteemed landscape architect Joseph Linesch, who had a knack for turning blight into eye candy. While Long Beach’s Gas & Oil Department (LBGO) operates the islands, a wholly owned subsidiary of Occidental Petroleum (known as Occidental Long Beach Inc.) is contracted to perform the work of extracting fossil fuels from beneath the ocean floor. The THUMS islands include portions of Pier J in the Port of Long Beach, and were constructed from a goliath supply of stone from Catalina Island–640,000 tons of it–along with 3.2 million cubic yards of sand from Long Beach Harbor. The purpose was to exploit the vast reserves of the Wilmington Oil Field, which stretches 13 miles long and 3 miles wide, from onshore San Pedro to offshore Seal Beach. Since it was first discovered in 1932, 6,150 wells have been drilled in the oil field, with nearly 1,550 pumps still active. It’s estimated the Wilmington reserves originally contained 3 billion barrels of oil, with around 300 million barrels left in the tank today. In 1940, Long Beach began to sink as a result of so much oil being drained from beneath the city. By the early 1950s, this so-called “subsidence” phenomenon was causing the city’s elevation to drop by approximately 2 feet per year. The results were destructive: Streets cracked, pipes warped, and buildings became unsafe. The sinking even caused minor geological tremors. In 1953, Long Beach began injecting water into the oil reservoirs, and the subsidence stopped. It’s safe to say the wells have been a bit of a cash cow for Long Beach, accounting for almost 5 percent of the city’s total budget–almost $80 million annually over the past two years alone. The city has used nearly every technique in the oil playbook to pump the liquid loot out of the ground, including the contentious practice known as hydraulic fracturing or fracking. The process involves shooting a virulent cocktail of water, sand and chemicals deep underground to force oil and natural gas to the surface. Fracking is typically utilized in tricky geological areas where other extraction methods can’t get the job done. With this odd memo, LBGO appears to be attempting to fend off internal critics as tales of fouled aquifers, toxic air pollution and earthquakes associated with fracking operations have made their way to California from places such as Oklahoma, Texas and Pennsylvania, where these types of problems have been well-documented. Citizens across the country, including many in California, want fracking banned outright. Their belief that the practice is unsafe is shared by many in the scientific community. The fight against fracking is spreading across California, with voters backing ballot measures banning the practice in San Benito and Mendocino counties. In the Los Angeles area, Beverly Hills has outlawed the practice, and residents of Culver City, Carson and Baldwin Hills are pushing for similar resolutions, as are citizen groups in Orange County’s Brea. Read the rest at OC Weekly.